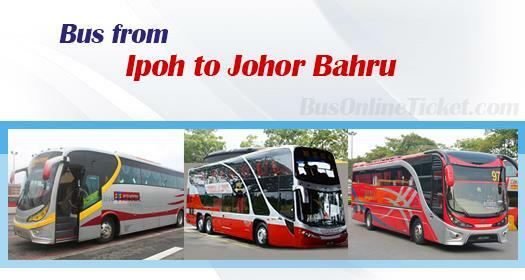 Bus from Ipoh to Johor Bahru remain as the important bus service in Ipoh especially for those who are working and studying in Johor Bahru and Singapore. Bus service for this route remains competitive in today context even with the stiff competition from budget airlines and train services. Konsortium Express, S&S International Express and Maju Express are the three major bus operators who provide bus service from Ipoh to Johor Bahru. Their combined daily trip is 6 departures for this route. The earliest bus service starts at morning 09.30 and the last bus leave the bus terminal at night 11.15pm. Both Konsortium Express and Maju Express are well-known with their spacious and thick cushion seat which ensures passengers having comfortable long-distance journey. The bus fare for the bus from Ipoh to Johor Bahru is charged at about RM 53.20 depending on the choice of bus operators. The bus journey from Ipoh to Johor Bahru takes about 7 hours, travelling about 530km. The actual duration of from Ipoh to Johor Bahru is depending on traffic and weather condition on the departure day. Most of the buses provide at least 1 washroom break along the journey. The departure point for bus going to Johor Bahru from Ipoh is located at Aman Jaya Bus Terminal. Almost all buses to Johor Bahru would terminate at Larkin Terminal, the main and largest bus terminal in Johor Bahru. Besides that, the bus would stop at few points like Skudai and Tun Aminah bus stops along the way to Larkin Terminal. From Larkin Terminal, you can also take city bus or taxi to the famous theme park, LEGOLAND Malaysia. BusOnlineTicket.com is a popular transport ticketing portal in Malaysia. Online booking in BusOnlineTicket.com is simple and convenient. You can also check for the admission ticket price for LEGOLAND® Malaysia here: Legoland® Malaysia 1 Day Water Park and LEGOLAND® Malaysia Theme Park Tickets (JHB).